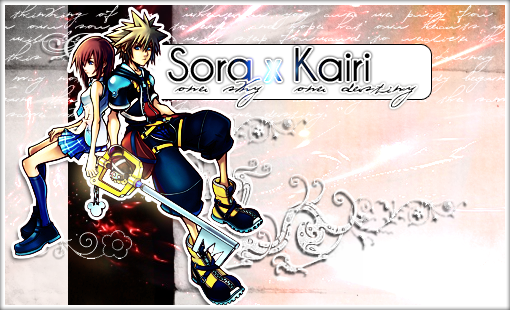 Why do you like Sora/Kairi? What made you decide to ship the pairing, and why? With me, I liked the couple from the time that they first started interacting, becuase they seemed like a classic case of "will they/won't they?" love story. If it were to turn romantic, then their relationship has little pieces of everything that I like in a love story: awkward teenage romance, childhood sweethearts, knight rescues princess, etc. Re: Why do you like Sora/Kairi? Prolly because they are canon. I actually haven't played the first game, only the second, but it's still good interaction. I just like them best. I have this odd habit of just liking canon pairings right off the bat. Well, technically they aren't canon until one of them says, "I love you," or they kiss, but I like to think that the series is headed in that direction! And I tend to like canon pairings too; they used to be the only kind that I liked (and strongly hinted couples like SoKai) until I discovered some of the crack pairings in Kingdom Hearts! Inoue- You should really play the first game! The interaction is even better than the second game; it's the one where he searches all over the worlds for Kairi and invades Hollow Bastion with nothing but a toy sword to save her! Aw, the toy sword! That part was so cute!